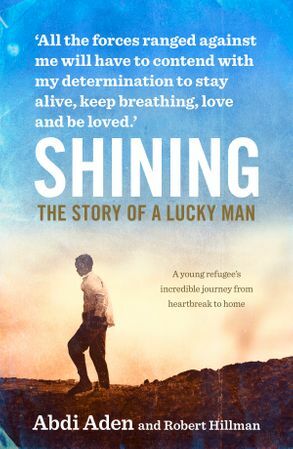 A remarkably warm-hearted, uplifting and inspiring story of one boy's survival against the odds. Abdi's world fell apart when he was only fifteen and Somalia's vicious civil war hit Mogadishu. Unable to find his family and effectively an orphan, he fled with some sixty others,heading to Kenya. On the way, death squads hunted them and they daily faced violence, danger and starvation. After almost four months, they arrived in at refugee camps in Kenya - of the group he'd set out with, only five had survived. All alone in the world and desperate to find his family, Abdi couldn't stay in Kenya, so he turned around and undertook the dangerous journey back to Mogadishu. But the search was fruitless, and eventually Abdi made his way - alone, with no money in his pockets - to Romania, then to Germany, completely dependent on the kindess of strangers. He was just seventeen years old when he arrived in Melbourne. He had no English, no family or friends, no money, no home. Yet, against the odds, he not only survived, he thrived. Abdi went on to complete secondary education and later university. He became a youth worker, was acknowledged with the 2007 Victorian Refugee Recognition Award and was featured in the SBS second series of Go Back to Where You Came From. Abdi Aden was a teenager when he arrived in Melbourne as a refugee to begin a new life. Until recently he was a Youth Worker for Hume City Council in Melbourne and he recently completed postgraduate studies in adolescent mental health. He is married to the daughter of British immigrants and has three young sons.